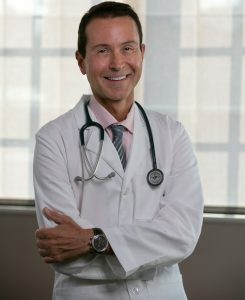 Dr. Fred Pescatore is a traditionally trained physician practicing nutritional medicine in Manhattan. He is the author of seven books, including the New York Times best seller The Hamptons Diet and the number one best-selling children’s health book, Feed Your Kids Well. His latest release, The A-List Diet, is sparking a weight loss revolution by revealing his celebrity-tested-and-approved method for losing weight quickly and easily—and keeping it off for good. Prior to opening his own practice, Dr. Pescatore worked closely with the late, great Dr. Robert C. Atkins, as the Associate Medical Director of the Atkins Center for Complementary Medicine. Now, “Dr. Fred” is internationally recognized as a health, nutrition, and weight loss expert in his own right. He is the former president of the International and American Association of Clinical Nutritionists and a member of the American College for the Advancement of Medicine. He is currently on the editorial board of Total Health and US Weekly magazines and is a regular contributor to In Touch, First for Women, and Women’s World magazines. Major network television shows like Extra, The View, Rachael Ray, and Today have sought out Dr. Pescatore for his expert health advice, and his practice has become a haven for the rich and famous, drawing a roster of clientele that reads like a “Who’s Who” of Hollywood’s elite. Dr. Pescatore is also deeply involved in the philanthropic community, devoting time to working in hospitals in Tanzania, as well as helping support various health organizations throughout the U.S.
Now, Dr. Pescatore’s greatest achievement is on the horizon. His latest book, The A-List Diet, combines advancements in nutritional science with his clinical expertise to create a revolutionary breakthrough in weight loss. For the first time, this book reveals to the public how patients at his clinic—including Hollywood stars, Broadway legends, wealthy socialites, pro athletes, and others from all walks of life—have transformed their bodies and their lives. Click here to order your copy of Dr. Pescatore’s groundbreaking book, The A-List Diet.